Imagine you study history. You and your colleagues are experts on the history of France, Poland, Spain, all those European countries. And one of the things you do is to study old documents, and you have this old book, this very very old book, that chronicles the life and times of some historic people in some historic period, but you don’t know exactly when it is from or where it was written. You cherish this old book because it has real personality … the stories told there are diverse, intense, mundane, important, numerous. It is a rich document that tells credibly of a time and place some time in history of one of those European countries you and your colleagues study, and even though you are not quite sure when or where or who or what the book’s many fascinating pages are about exactly, you assign big chunks of it to your students and you reread and reread and reread the narratives because it is just that good. Then one day you go to a conference of historians and there is a special symposium being held by some well regarded colleagues, who have been working for months with some archaeologists on a secret project. Oh, and this ancient book you’ve been reading and assigning to your students, but could not place in time or space? They tell you that it was written in Atlantis in the 6th century AD! It is not about Europe at all. It is about a place that until moments ago you did not know even existed but that is akin to, on par with, like but different from, linked to but separate from, your beloved subject. You thought it was fun becoming an historian, learning all that stuff about all those people, times, and places. And now you get to do it all again! The idea that among the dinosaurs are birds, or as it is more commonly said, that birds are living dinosaurs, is catching on and I think most people understand this now. But what is less widely understood, I think, is that contemporary with the early birds, from a time when both the classic dinosaurs (by our Hollywood and sci-fi driven way of thinking) and the ancestral birds existed side by side, there were many species that possessed bird-like characteristics but that simply were not birds at all, and that you would never mistake for being birds. As I’ve discussed before, that which makes a bird a bird in our modern birding and bird-loving minds is a set of features all of which are to be found in the early contemporaries of birds, among non-birds. Of those traits, there are two kinds: The ones that are bird-like, but are not shared between birds and other animals because of a common ancestor having had the trait. Flight is an example. There were vertebrates that flew, relatives of the classic dinosaurs, but flight evolved in those lineages independently. The second kind of trait are those held in common by different bird and non-bird lineages because of common ancestry. The hollowed-out bones connected to the lungs for respiration that we see today as a key bird adaptation to the aerobically challenging behavior of flight existed in many dinosaurs that were as far way from being bird-like as, well, as a T-rex is from being your pet parrot. This and other traits (such as feathers and bipedality) evolved in the common ancestor of a huge category of dinosaurs that happens to include birds. Among those extinct forms there were some that not only had traits that we think of today as bird-traits, but that had those traits together and in a form that was not too different from modern birds in some ways. These animals were small, had highly efficient respiratory systems, were feather-clad, and may have soared around a bit. But they were definitely not birds. If you find fossils of a dinosaur that evolved way after birds arose, and it was nothing like a bird in overall gestalt (giant thunder lizard predator thing) then you don’t really have a hard time placing fossil chickadees and said dinosaur in relation to each other taxonomically. But if you find a bunch of bird-size bones with a bunch of feathers and other bird like features from several different similar species, then, in order to place those fossils on the correct branch of the dinosaur family tree (at the level of detail where one of those branches includes the modern birds and the others don’t) then you have to get quiet technical. In fact, you have to get downright cladistic. Simply put, a trait that is presumed to be genetic and thus indicative of phylogeny needs to have certain characteristics, and by this I mean, we need to understand it in certain ways. First, the trait can’t be too labile. It needs to be something that is not affected in a willy-nilly way by developmental or environmental factors. In other words, it must be measurable and consistent, what we call in the trade “well behaved.” The trait must then be identifiable as to whether or not it exists in a certain species. This requires a few things to be true, depending on the fossils. For instance, in primate phylogeny, postcranial traits (bony traits of the body, not the head) are usually useless because we can’t link teeth to bodies in most cases, and the teeth drive the taxonomy (though there are some recent exceptions). The traits have to be unambiguously linked to the entities we are calling extinct species and thus, the traits are unambiguously linked to each other. Once you have a trait that is well behaved and unambiguously associated with some species (yes, they have it) and not others (no, they don’t have it) we need one more thing to make the trait work as well as it possibly can work: Polarity. We need to know which trait evolved into which. In technical terms, we want to know what the “pleisiomorphic” state of the trait is as opposed to the “apomorphic” state. That means, we need to know which trait exists in an ancestral species (primitive, pleisiomprhic, ancestral) as opposed to a trait found in a descendant species, which we call apomorphic (derived, as in descent with modification). What evolved into what? Ultimately, we want to group together species that have the same derived trait into a single clade, and then sort out that clade with other more finely tuned traits. The ideal outcome will be a set of bifurcations … no species ever gives rise at the exact same time to more than one other species, all speciation events are assumed to be simple splits from one to two species, even when they are not. For example, in mammalian evolution, with almost no exceptions, teeth are lost and not gained across evolutionary time. The ancestral mammal probably had 11 upper and lower teeth on each side for a total of 44 teeth. Cats have eight on each side on top, and seven on the bottom. Horses have six upper and lower on each side. If you lay out all the mandibles and maxilla of all the mammals, you could construct a phylogeny that would be a pretty good first stab at a reasonable mammal family tree. If you added just a couple more traits (how many bones in the foot, a few skull details) you would get a perfectly accurate but under-determined phylogeny, with many species grouped together at the ends of the accurately arrayed branches. If you have three closely related mammal species and two have the same dentition but with fewer teeth than the third, you can be almost perfectly certain that the reduced dentition is the derived (apomorphic) state, and the larger number of teeth is the primitive, plesiomorphic state, so the two with the reduced dentition would be considered as members of one clade to the exclusion of the third. Body size would be an example of a trait with too much lability in many animals. Most deer and antelopes descend from smaller ancestors … this group of animals got bigger over time in many lineages … but there are plenty of reversals. Among apes, many are probably larger than their ancestors (gorillas are blown-up versions of a chimp-like ancestor) but some are not (gibbons are probably smaller than their common ancestor with chimps). With this sort of potential confusion, one could imagine a scenario where you think you’ve got it all figured out, with several species sitting on the proper branch of their species family tree, when suddenly you discover that you’ve got the polarity of a few traits backwards and suddenly … things change. And this is where the latest research related to Archaeopteryx comes in. 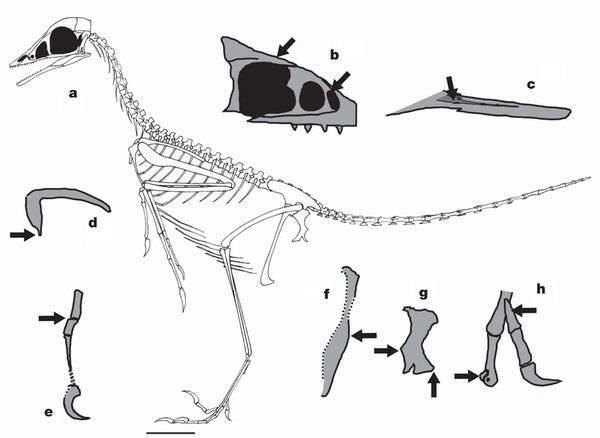 The new research looks in detail at another fossil, Xiaotingia zhengi, which is not on the bird lineage, being one of those non-birds with bird like traits. Xiaotingia zhengi did something that has happened to you before, I’m sure. Imagine that you go to a school reunion and off on the other side of the room you see a person that you are pretty sure you remember from college days. Her name was Amy. Somewhat different hair, dressed up a bit more than you and your friends ever were, looks taller than you remember her, but still, that’s gotta be Amy. Maybe. Then, a second person walks in who is definitely Amy’s sister. You remember that her name is Emily. But you immediately notice that the woman you thought was Amy is much taller then Emily, but Amy and Emily were, back in college, the same exact height. You vaguely remember losing a bet over which one was taller, so you are pretty sure of this. So-called “Amy” has been knocked from her perch. The woman across the room is not Amy, just someone who looks enough like her to have confused you momentarily. As you wander off to get some more punch, you also recall how Amy always reminded you of a bird… but I digress. And the researchers were surprised and confused at first, but they dug into it. First they pulled Xiaotingia back out of the database and ran the program again, and guess what? Archaeopteryx went right back to being a bird again. Then they put Xiaotingia back in again and Archaeopteryx shifted to a non-bird again. There is no telling how many times they went back and forth. They probably went and got their friends from down the hall and dragged them over and said “Hey, look at this” and showed them as Archaeopteryx fell off the bird family tree and jumped back on the bird family tree again and again. Let’s look at one trait and see how that played out inside the computer. Experts have long felt that long and robust forelimbs characterized the Avialae (bird ancestors), being derived for that group. Since Archaeopteryx has that trait, that would be support for putting it in that group. The recent study, however shows that this trait is also found in non-Avialae (in the maniraptorans, to be ‘exact’) which is a sister clade to the Avialae. This does not force Archaeopteryx to move to another clade, but it does make that one piece of evidence for placing Archaeopteryx on the bird lineage irrelevant. Long and robust forelimbs are no longer “synapomorphies” (shared and derived) for Avialae. The forelimbs … they do nothing! Archaeopteryx is, however, likely to be grouped with non-Avialae because of a number of synapomorphies (shared and derived) traits with that group, including (but are not limited to) a large promaxillary fenestra, a T-shaped lacrimal with a long anterior process, a groove widening posteriorly on the dentary, a phalanx IV-2 that is significantly shortened relative to IV-1, a short ischium with a distally located obturator process and a posterodistal process, and a highly extensible pedal digit II. a, Skeletal reconstruction (modified from Fig. 6.53 in ref. 16). b, Preorbital region of the Thermopolis specimen in lateral view. Arrows point to the long anterior process of the lacrimal and the large promaxillary fenestra. c, Anterior half of the mandible of the Eichstätt specimen in lateral view. Arrow points to a posteriorly widening groove. d, The furcula of the London specimen in oblique view. Arrow points to an L-shaped cross-section of the lateral end of the furcula. e, Manual digit IV of the Berlin specimen in dorsal view. Arrow points to the rigid connection between the long phalanx IV-1 and the short IV-2. f, Right pubis of the Solnhofen specimen in posterior view. Arrow points to a lateral expansion at the pubic mid-shaft. g, Right ischium of the Thermopolis specimen in lateral view. Arrows point to the distally located obturator process and a triangular posterodistal process. h, Right pedal digits I and II of the Thermopolis specimen in oblique view. Arrow points to the medially positioned pedal digit I and the prominent dorsal expansion at the distal end of phalanx II-1. Most of the illustrated features here are only seen in archaeopterygids and other Deinonychosauria. Scale bar: 3cm (a). But the new study is enough to throw reasonable doubt on the position of Archaeopteryx as a basal bird. But, more importantly, it might free up Archaeopteryx for a new career, as poster fossil for those strange and wonderful, no longer existing animals that were neither dinosaurs of Jurassic Park variety nor birds of the Chickadee and Chicken Hawk variety, yet oddly both, sort of in between but not really. Archaeopteryx is to birds what that wonderful book from Atlantis would be to history, with one important difference: Archaeopteryx existed, Atlantis did not. And as a postscript, I should note that the real loser here is not Archaeopteryx, but rather, Xiaotingia zhengi. The study was supposed to be about Xiaotingia zhengi but suddenly all the attention is going to Archaeopteryx. Archaeopteryx always seems to get all the attention. No fair. 1The process of going from the four-Class assumption of tetrapods (amphibians, reptiles, birds, mammals) with dinosaurs being a lizard to the modern conception which is quite different did not happen at a single symposium! But given that the understanding that these non-bird bird like animals existed, that birds are a form of dinosaur, and that many dinosaurs that were nothing at all like birds were “bird like” in important, birdy ways, is not really popular knowledge, we can pretend that this was an instantaneous revelation for poetic purposes. But at least IDists and creationists are having a joy ride. This is a great article. I think Greg deserves a pair of binoculars. Paulino, well sort of. It’s more like there are a bunch of twigs and branches and every now and then you move around all the twigs, and the one that ends up with the birds is the bird branch. Nicely done, Greg, and most definitely binocular-worthy. I think the IDiots and other creationists are all delighted that the iconic ‘transitional fossil’ isn’t *the* transitional fossil people might have thought it was, because they don’t understand that evolution isn’t a nice clear-cut chain of ascending steps–the old “if humans evolved from monkeys, why are there still monkeys” canard. Instead, divergences are messy affairs with lots of similar but slightly different forms all trying to survive. Some do, and may lead to crown clades in the long run; but most don’t. Fossilization and taphonomy don’t play favorites, however, so it’s always a crapshoot as to which forms get recovered, and which others are gone forever. Wow. I totally understood all of that. And that’s saying something. I think a lot of people still have this odd notion that dinosaurs shoulda taken one look at “the first bird”, said “You’re clearly the wave of the future”, and obligingly gone extinct. Or something like that. Ergo, having all these simultaneous lineages is confusing. As if maybe it would make more sense if all dinos, from triceratops to T-rex, evolved into birds. “Birds” was next on the list, right? You are such a good teacher, Greg. Now I have a better understanding of how fossils are organized. Like your explanation of categorizing based on traits. They need to be measurable and consistent. We need to know if the trait is ancestral or descendent — which determines polarity — a new use of that word for me. an extra special set of binnoculars for you! Great post Greg. I will use this with my students. It is an excellent example of how our ideas about evolutionary lineages are subject to change with new evidence. This is how science works! Wow, how did I miss this? Thank you for the clear explanation. It seems as if Archaeopteryx is to birds what Australopithecus is to humans — a cousin down around the base of the family tree, but not a direct ancestor.